I'm So Full I'm Forgetting to Eat! What's in those Medifast replacement meals anyway? Pillows? This morning I had an oatmeal raisin crunch bar for breakfast and was so satisfied I didn't realize for three and a half hours I was due for another meal. Though I wasn't really hungry, I forced myself to make a Dutch Chocolate milkshake, which I am sipping now as I type. Because I opted for the Medifast automated shipping plan, I received a complemenatry BlenderBottle® which has a patented removable ball that makes the powder quickly blend with the water with about forty shakes. The shakes taste the least fake of all the food I've tried to date, possibly because I'm already used to the taste of diet drinks. I can even make shakes at work. So far I am finding this to be the easiest diet ever. Obviously the food is something a card carrying foodie or health nut would be horrified by, but I realized this going in. Happily, the faux flavors are less off-putting than I thought they would be. 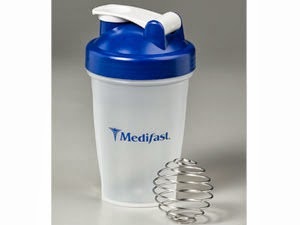 Medifast must have done its homework with focus groups to offer replacement meals that are palatable. Having gone through a full day of the program already, I can easily see doing this until I lose my 30 pounds. Or will those be my famous last words? Stay tuned. "I don't do diets." "Diets don't work." "I'll just change one habit a week." "I'll eat less and move more." "Really, it's impossible to lose weight after 50." I've said all those things in the five years since I hit 50, watching my weight escalate from 138 to 168. The "I only have 10 pounds to lose" became 20, then 30. After five years of wishing the pounds would magically disappear, I was ready to try something that has a proven track record. Having successfully lost weight with almost every type of diet in my life -- from Weight Watchers to South Beach to the Scarsdale Diet (remember that diet doctor who was killed by his school mistress girlfriend?) -- it had to be something new. Part of what makes diets work for me is the novelty factor. If I have to be deprived, I want it to at least feel like an adventure). So why did I choose Medifast? Mostly because it met both the novelty and efficacy tests.Two random people I know (okay, one is my morning radio guy so technically I don't "know" him) did Medifast this past year and lost a ton of weight. Not surprisingly, my friends and family are skeptical. Last night, while savoring shrimp with lobster sauce and house special chow fun at my "Last Supper," younger daughter informed me I would gain all my weight back after I lost it because low-calorie diets slow your metabolism. My body would think it was starving and hang on to every drop of food, like a meth cooker hoarding Sudafeds. I couldn't really argue with her. That could've been me saying the same exact thing to a friend a few months ago. But I did some research, and many people do manage to keep the weight off. The Flabby Road blog is written by a woman named Jennifer Lilley who has kept off the 70 pound she lost with Medifast for six years. So what's it like to be on Medifast? I'm three meals into the day and the good news is the food isn't horrible. So far I've had a chocolate chip soft bake, parmesan puffs and a dark chocolate anti-oxidant shake, and they were all doable. I'm also drinking more water and looking forward to an invigorating walk with my music after I finish typing this. Mostly I'm excited to see what happens. I'm hoping my lab numbers improve (no chronic diseases yet, but I'm borderline everything) and I can fit into my favorite jeans by January. Join me on this journey to see how I do and if Medifast can work for you, too.